South Korea rose six notches in an international corruption awareness ranking to No. 45 of 180 countries in 2018, a report from a global anti-corruption watchdog showed. 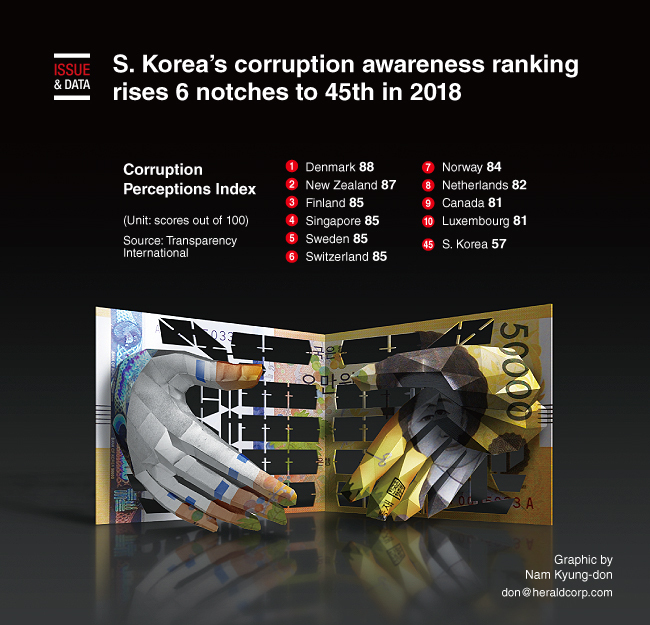 South Korea scored 57 out of 100 points in the 2018 Corruption Perceptions Index report issued by Berlin-based Transparency International. The index evaluates countries based on how corrupt their public sector is perceived to be, using corruption-related data collected by governance and business experts, according to Transparency International. Denmark topped the list with 88 points, followed closely by New Zealand at 87.